The BIG POTS CD AND DIE KIT will teach you how to make large jars using extruded bands. 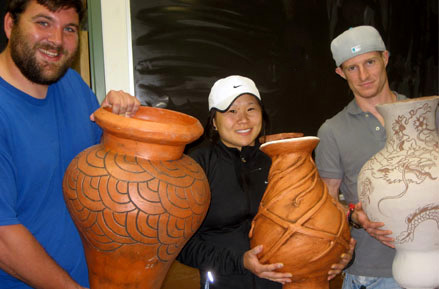 At Eastern Michigan University, for more than ten years, we have been teaching beginning ceramic students—art majors and non-art majors—to make BIG POTS. Both teachers and students are delighted with the results, as I think you will see from their photographs. To prepare students for this assignment I present slides of historical pots and storage jars, beginning with Guan from Kansu, China, circa 3,000 B.C., and Jomon pottery from the same era, but from Japan. Both are unglazed wares. Students can also research centuries of jars and vases from China and elsewhere for inspiration for their forms. Building these pots is the continuation of a human activity that began thousands of years ago when they were necessary for food storage—whether for grain, or oil, wine, or fish paste. Students experience the building of these important forms as a personal recreation of ancient ceramic history.